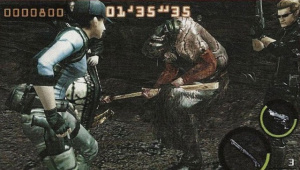 When Resident Evil: The Mercenaries 3D producer Masachika Kawata hinted that the game will contain secret content that he thought fans would enjoy, that was enough to make many of you vocalise which Resident Evil characters you would like to see appear as unlockables. Looks like some of you may get your wish granted. As reported by Siliconera, the latest issue of Famitsu has revealed two more characters that will make an appearance in the game. Aside from the four that have already been announced ― Chris Redfield, Claire Redfield, Jack Krauser, and Hunk ― the Japanese gaming magazine has revealed that Jill Valentine and Albert Wesker will also be included in the game. We're not sure if they will be available from the start or whether they have to be unlocked in order to be playable, but fans of the series will definitely be happy about their inclusion. The official game page on Capcom's website dates the Japanese launch as 2nd June, so it looks like the West will have to wait until June at the earliest. Time to welcome back the first lady of survival horror, and also that traitorous, shades-wearing antagonist. Aww, we love him really. Yippee, two more campy, mediocre looking characters. Characters have always been the weak link of the series. And yet again, the inferior version of Jill. Feels bad. Leon(Mushroom cut sporting, arrogant fearless cop) and Claire(Mrs. Luinette the Clown) are the weakest links of the series. They both look like cartoons, especially with their debute in RE2. yeesh. A Fantastic game, with lame looking characters...I can't stand Ada either, she's easily got to be the worst. Chris, Jill and Barry are where it's at. And speaking of Barry, he better make it in the roster! I wouldn't mind seeing Rebecca either. And get Krauser out of there, he's an a**hole. Anyways, RE seriously needs a Reboot after Revelations. And it's great that Wesker has been officially killed off in RE5. His cheesy Matrix-bs'n time is up. RE needs new characters and a new start. Any version of Jill isn't bad. Jilll, she's a of member of S.T.A.R. you know. Wesker: Maybe it's..... Chris..... Jill, will you go check it out? Barry: I'M GOING WITH YOU!!!! CHRIS IS OUR OLD PARTNER Y'KNOW!?!?!?!? As long as Jill isn't blond, I'm relatively happy. Obviously I'd prefer her original STARS attire, but what can you do. LMAO, I love it when Barry says that last line haha. Or when Wesker says,"DONT OPEN THAT DOOR!" Iol And I never thought any of this was comical back when I was 12 years old when I first played it. Maybe because voice acting was so new to gaming at 'that' time that i was just too blown away by it, and that i didn't have any standards towards it at all. It sounded great to me back in the day! Barry (handing Jill ammunition, and not a weapon): Take this weapon, it's REAALLLY POWERFUL, it's effective against living things! Jill: Thanks, Barry, but what about you? Barry (raising hand, briefly showing Magnum, then quickly drawing back): I HAVE THIS! and also that traitorous, shades-wearing antagonist. Aww, we love him really. Yep. I'll know who Ill play as. This game is for the fans, so Barry better make the cut. Since this game is just Mercenaries as a stand alone it should have every character possible! Aw yeah, two of the best characters in the series, teaming up to take down some freaks. I want an unlockable sandwich costume for Jill! PLZKBAI! My friend owes me five bucks; I bet him that Jill and Albert would be announced to be in the game first, he said Leon and Ada. Kruaser was the best from RE4, so I'm glad he's gonna be in this one, but I really want to see Billy Cohen in this one. Oh, and Rebecca Chambers while we're at it. I wanna see that awesome grenade melee attack she had in UC.